Are you creating and publishing content that only talks about your organization or is filled with sales pitches for your products and services? If so, it’s time to stop. There’s a better way. If you’re serious about building (and eventually monetizing) an audience, the real secret is patiently building an audience that knows, likes and trusts you. You do this by publishing compelling, relevant and audience-centric content that people want to consume — because your content is valuable and useful. Your brand needs to become the leading expert on a topic. To do that, you need to create content people actually want and would be willing to subscribe to. Here’s how you can build a content-first business in six steps, as well as examples of brands that have done it successfully. Joe Pulizzi, founder of Content Marketing Institute, shared these insights at Adobe Summit last month. You need to find your brand’s sweet spot — the place from which you can communicate your authority. This sweet spot lives between the knowledge/skills you have to offer and the customer pain point you can solve better than anyone else. Look no further than The Furrow, a magazine published by John Deere since 1895. John Deere probably knows more about agriculture and tech than anyone, and the pain point they try to solve for customers is operational challenges farmers face (e.g., how to hire the right people, what technologies to use). Oh, and how many times has The Furrow inserted a John Deere product into the content? Only about 15 to 20 times. In 120 years! The Furrow is totally audience-centric. They believe if their customers like and trust them, they will buy another John Deere product. Takeaway: Find your brand’s sweet spot. It will give you something unique to write about. Most brands stop once they’ve found their sweet spot. The result: Brands end up creating content just like every other competitor and media company. 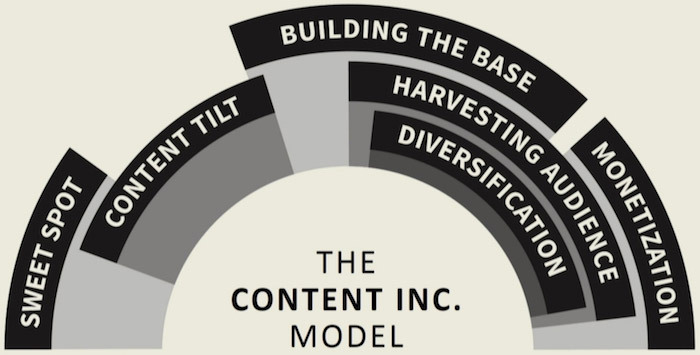 A content tilt is an area where there’s little to no content competition. Finding a content tilt gives your brand a chance to break through. You’re telling a differentiated story, one nobody else is talking about in exactly the same way as you. Finding your content tilt is the most important step, Pulizzi said. Ann Reardon, the “baking queen of Sydney, Australia,” knows this. In 2011, this stay-at-home mom and passionate food scientist decided she wanted to start a career in food but didn’t know how to start. So she decided to start a YouTube channel. By January 2012 she had 100 subscribers. Fast forward to today. More than three million people are subscribed to Reardon’s YouTube channel. She may not have had a budget or any resources. But she had a content tilt. Reardon’s content tilt was impossible food creations; she made tasty treats including a five-pound Snickers bar and a cake featuring an exact replica of Instagram’s logo on the inside. She wanted people to be amazed at her seemingly impossible-to-make recipes. She did it first, did it really well, and became the expert. Takeaway: Find a niche where you can be THE leading expert in the world. Being a content-first business doesn’t mean you need to repurpose every piece of content you create into 72 other pieces of content for every possible platform (e.g., videos, podcasts, snaps, webinars, ebooks, etc.). One content type: Is it written text? Videos? A podcast? Something else? One main platform: Do you want to be found via posts or articles you write for your own blog or brand publication? On YouTube? In iTunes? Something else? Consistent delivery: Decide how often you want to publish content, whether it’s twice a week, five times a week or every day. Just maintain a consistent schedule. Over a long period of time: The average time from starting to monetization is between 12 and 18 months. Sony’s Alpha Universe has been publishing text- and image-based content on its own platform, daily, for the past couple of years. Adobe’s CMO.com has consistently delivered text- and image-based content for more than eight years. Adobe is generating record revenue. Takeaway: Focus on one content type and one main platform. Deliver greatness there consistently and over time. The smart way to harvest an audience is by focusing on email subscribers as a key metric. Building a large audience on social media platforms like Facebook and Twitter has some value and can be effective. But the social platforms hide valuable data from you and, ultimately, you have no control over who sees your content (unless you pay for it). With a simple tweak to an algorithm, your organic reach can vanish overnight. Just look at BuzzFeed. Not too long ago the company started freaking out when they realized they weren’t hitting their revenue targets. Why? BuzzFeed (as well as many other publishers) lost most of their organic reach on Facebook. Their content no longer spread as easily. Traffic was way down. So BuzzFeed started a new effort: newsletters. Readers could suddenly sign up to get newsletters like Dude A Day, Dog A Day, and This Week In Cats. This effort so far has driven more than 1 million subscribers for BuzzFeed. It’s accelerating and changing their business for the better. You need to do a better job of getting emails outside of demand generation. You want to build up your subscribers to generate leads from your base. Right now, too many marketers are doing it the opposite way. Being able to identify your highest yielding customers, because of the content they subscribe to, is incredibly powerful. Takeaway: Don’t build your house on rented land (i.e., social media). 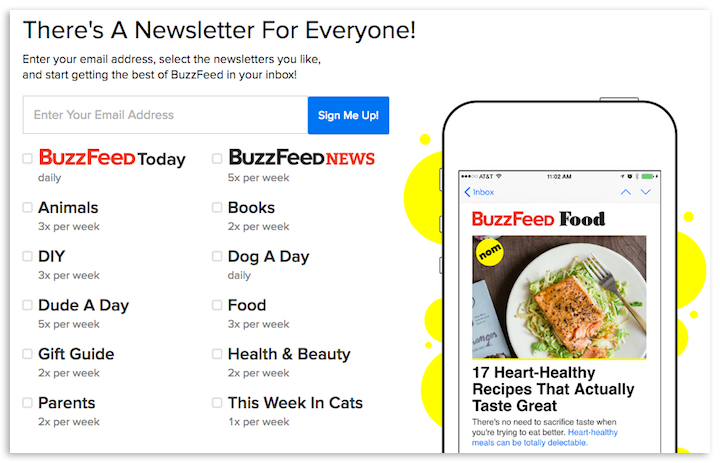 Build an audience of opt-in subscribers by offering amazing email newsletters and remarkable premium (gated) content. Once you’ve built your minimum viable audience, then you can start to diversify. In the case of Content Marketing Institute, they only had a blog for 36 months. That helped CMI build its minimum viable audience of 30,000 subscribers. It wasn’t until this point that CMI diversified, launching a magazine (Chief Content Officer), events (Content Marketing World), a podcast (This Old Marketing) and so on. This has worked for every successful media company. You start with a core offering, build an audience and then expand. It’s not rocket science. ESPN is another example. Once upon a time, it was just a cable channel showing sports programs 24 hours a day. Then came ESPN radio, more ESPN channels (ESPN 2, ESPNews, ESPN Classic), ESPN.com, ESPN the Magazine, the ESPY Awards, etc. Takeaway: Don’t try to do it all it once. Launch, iterate, get your offering right, build your audience… and then diversify. The marketing strategy is exactly the same whether your brand is a media company or sells a product or service. You want to create content that gives people a reason to subscribe, work through your system, buy from you and become loyal to you. This is where you find the ROI of your content marketing. Your subscribers will account for the majority of your revenue, whether you’re Sony or John Deere. Takeaway: Engagement is great, but it doesn’t pay the bills. You need to create a better customer. Think about all the possible ways to keep customers engaged, make them buy more from you and increase their loyalty to you. Ready to build your audience using content? Remember this: You must create value for your audience before you can extract any value from that audience. Too many brands try to extract value too soon in the pursuit of getting a download. Be patient. Content marketing is a marathon, not a sprint.